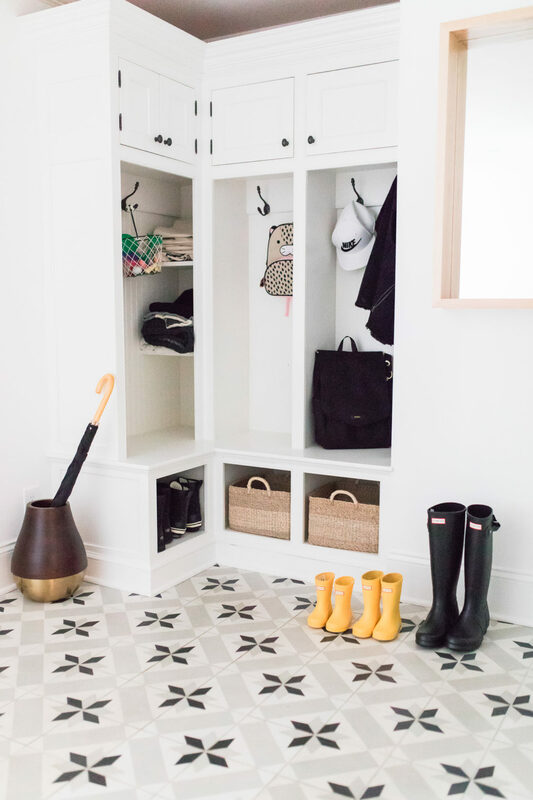 I knew immediately that I wanted to have a statement tile in our Entryway, Mud Room, and downstairs Powder Room. 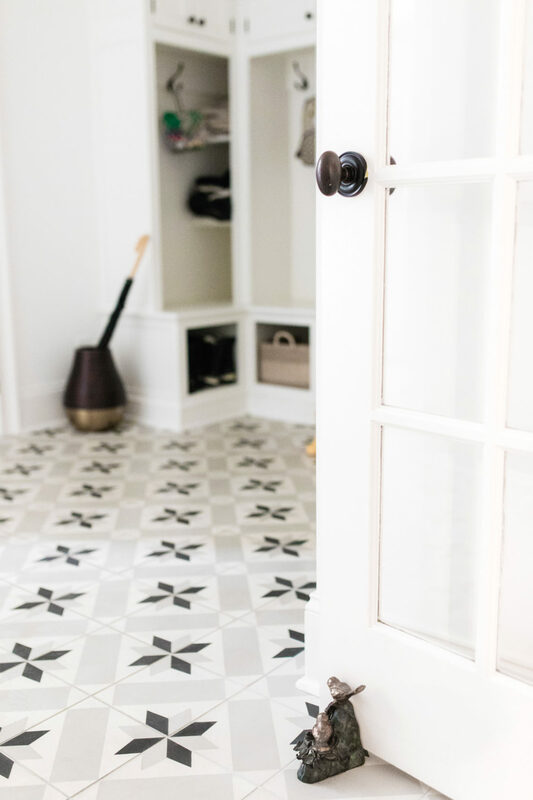 I recently have fallen in love with encaustic cement tile and thought it would be such a fun choice. I mad sure to keep the room really light and bright, and add warmth with some wood, natural weave and brass accents. 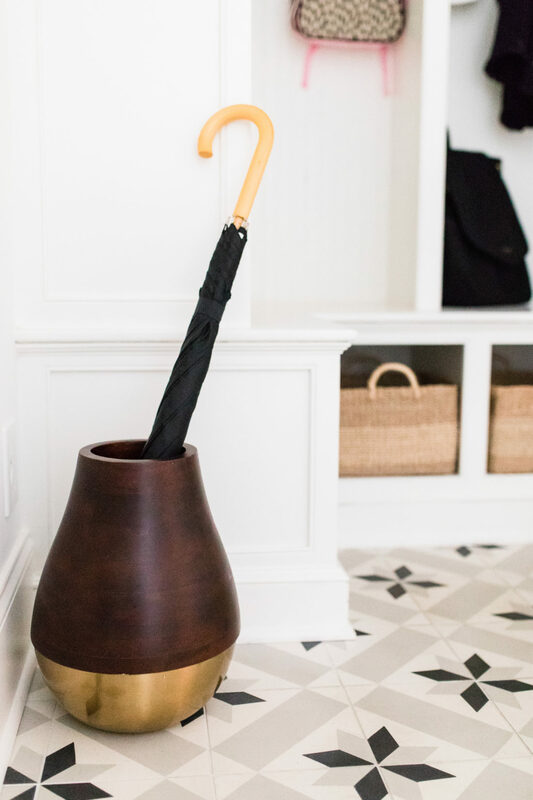 The most important thing about a Mud Room, of course, is that it is functional! 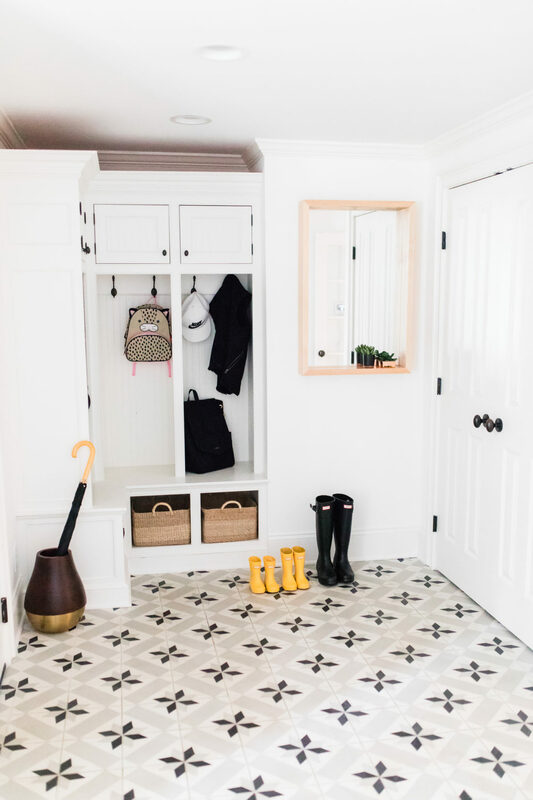 We use our Mud Room to organize all of the shoes, jackets, boots, accessories, diaper bags, school supplies, and baby gear that come in and out of our car and garage. I like to use baskets in the cubbies to hide the more unsightly items. We have a fairly strict “no shoes” policy in our home since Major is so close to the ground these days and we want to make sure the ickies on our shoes stay out of our family space! 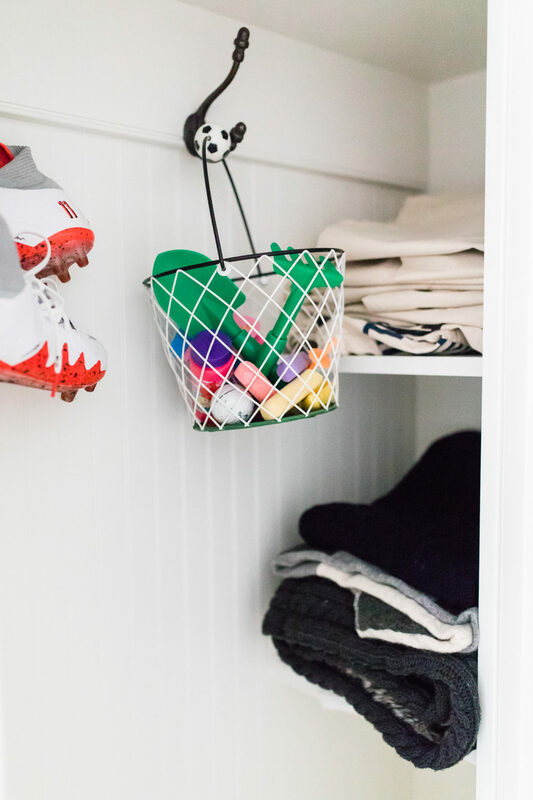 Mud Rooms definitely have a predisposition to collect all of the random items and detritus from our homes, though, so I make sure that I stay organized so this room doesn’t become a catch-all for junk! 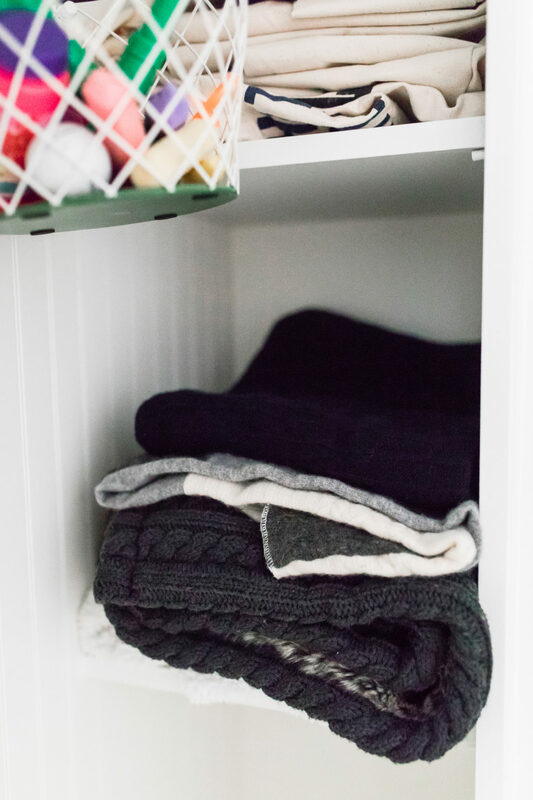 On Sundays, I sweep through and organize– clear out the junk and make sure that the items that can be put away in other locations find their homes. Go with a strong design concept so that the room looks pulled together even if it’s untidy at times! 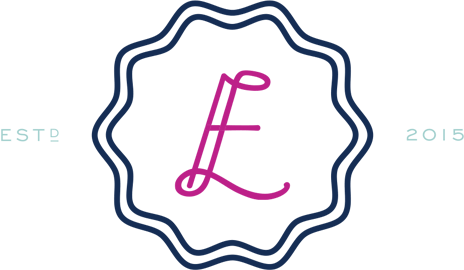 Give good-looking items a place of pride! 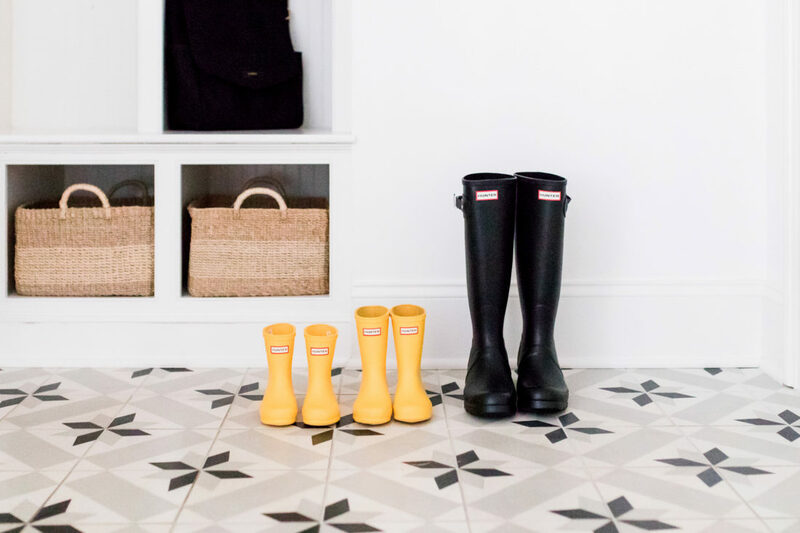 I love our Mommy-and-Me matching Hunter boots so I keep them out. 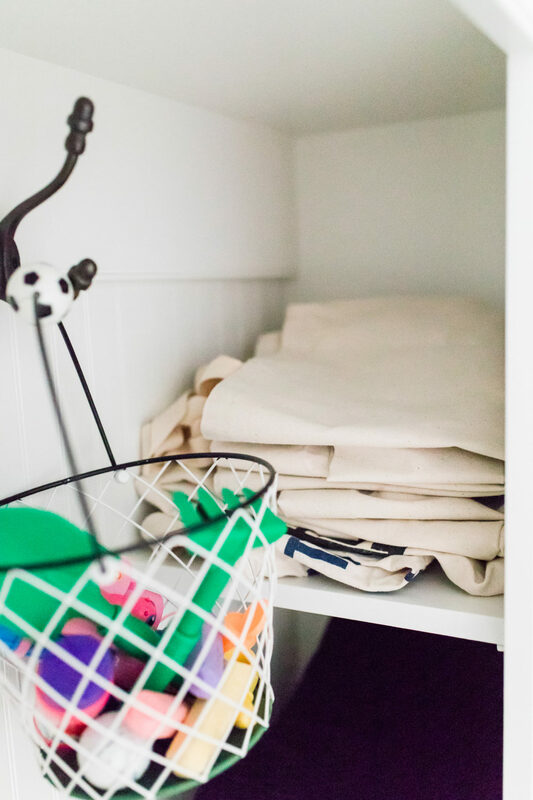 Keep folded canvas bags in one compartment of your Mud Room to grab before you head out to the store. It’s amazing how much waste you cut down on when you have easy access to reusable bags. Keep a small stack of stroller blankets in another compartment to grab as you head out on chillier days. I’ve even used a cozy wool blanket as an emergency “jumpsuit” for lowie with some strategic knots when we have had a potty accident on the road! 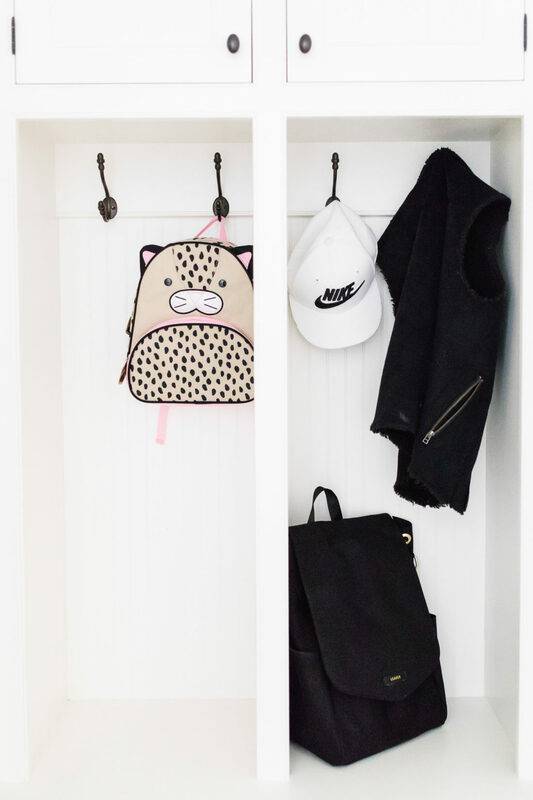 Commit to tidying up your Mud Room once a week so that it doesn’t accumulate junk. Include some cute foliage (I have two faux potted succulents) to bring the outdoors in! Don’t forget to hang a mirror to give your outfit a little check before you dash out the door! 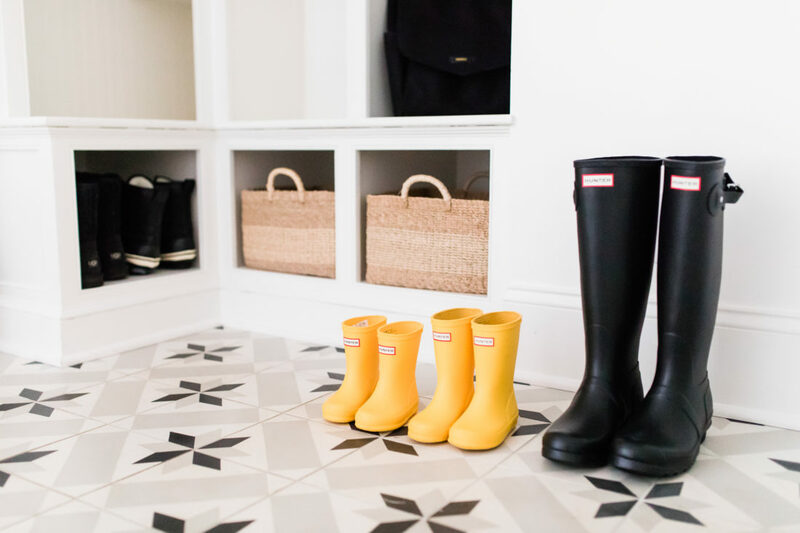 I seriously cannot wait for the day that I have a mudroom! They’re so great to have in a home. This looks awesome and I love the tile.